‘There is a kind of contempt in the act of speaking’, Nietzsche wrote in one of his cheerier moments. I think it articulates what the more garrulous of us feel after a day of too much talking – or too much listening. Lidija Šimkutė, who divides her time between Adelaide and Vilnius, is perhaps more economical than anyone writing in Australia today. Very few of the poems in this 144-page Lithuanian-English edition are more than a page, the lines are generally short – rarely longer than six syllables – and most poems have fewer than thirty words – including the titles which are the opening lines written in capitals. Everywhere the abundance of white space seems to underline the motifs of silence and quiet so prominent in the poems. As with most Eastern European poets, Šimkutė is incapable of triviality. Whatever the subject – solitude or language, love or nature – the physical and metaphysical are inseparable and the sacred merges with the material, as it does in icons. Such lyrics are fragile but tough. Fragile in the sense that a misplaced word might upset the delicate balance but tough in the best minimalist traditions: in their subject matter and in the fact that they are elemental and essential in a way that may remind readers of Serbian poet Vasko Popa’s Quartz Pebble Poems. Such poems – few in number – will be different for each reader, and, as with the brevity of haiku, can hardly be resented. 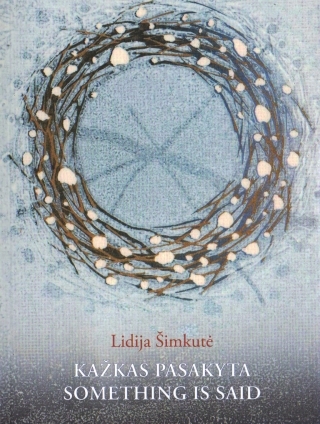 Though Šimkutė’s poetry has been praised by JM Coetzee for its ‘purity’ and ‘receptiveness to the world’, and has been anthologised recently by John Kinsella, it remains relatively unknown to readers in Australia. I hope Something is Said will redress this. This entry was posted in Aidan Coleman, Issue 15, Lidija Šimkutė, Lithuanian Writers Union Publishers, Something is Said, Uncategorized and tagged Lithuanian poetry, poetry, poetry translation, Vasko Popa by Mark Roberts. Bookmark the permalink.